Just when you thought you'd seen everything when it comes to nail polish, Nails Inc. proves there's still more to come. 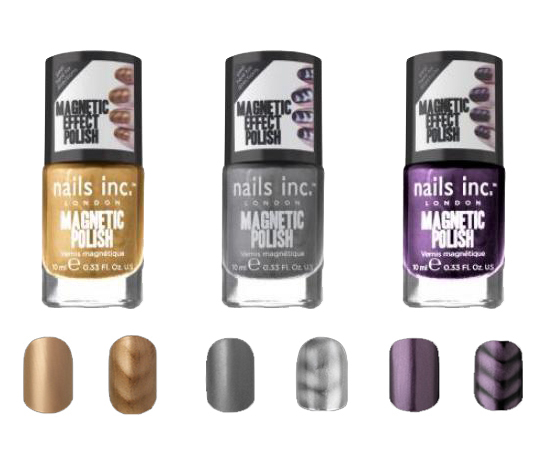 Nails Inc. recently launched a new line of Magnetic Polish consisting of 3 fabulous colors! The specially developed formula has metallic particles that create unique patterns when coming into contact with magnetic forces. The bottle has a magnet on top that you hold over freshly painted nails to create your own wave-like design. Watch the Sephora's instructional video here! Nails Inc. Magnetic Polish costs $16 each and is available online and at Sephora.com.